The most economical way to revitalize your bath! One Day Bath refinishes bathtubs, tiles, floors and cabinets to a like new condition. With our expert Bathtub reglazing we repair all chips, scratches and cracks back to a like new condition. Big question people have about reglazing is can you change the color? this “black and pink” bathroom has got to go! Answer : Yes we can change it to the color of your choice we can even make your tile and counter tops look like granite. Even if You have a hole in the tub we can fix it! Yes with our process we can also do all types of Fiberglass & acrylic enclosures even if your fiberglass tub has a Crack in it we can fix it. 95% of the work we perform is completed In just one day. Best of all your down time is only 24 HOURS! Tub & Tile Refinishing is a dream come true its affordable, there is no Demolition, the reglazing process is simple and stress free. Having a grout problem? No problem we can re grout your tiles And deep clean them to get rid of that unsightly mold, mildew & Water stains. We also can acid wash your floors back to a like new Condition. Tile reglazing is a favorite for our customers no longer having to scrub the grout lines and never having to regrout your walls again is just some of the reasons why tile refinishing is a favorite. 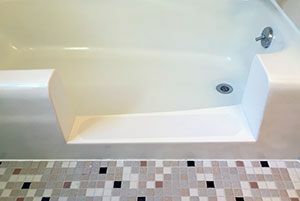 The product we use in our Tub & Tile resurfacing are mildew resistant. This translates into Effortless maintenance while at the same time eliminates mildew Build-up so clean-up Is a breeze. We offer a non-skid mat that becomes a permanent part of the finish, not like stick-on’s or strips. The non-skid mat is Virtually invisible and reduces the risk of accidents in the tub. We choose not to use Epoxy topcoats on tub resurfacing since their inflexibility tends To make them peel within two (2) years of application. The most Common product used today is epoxy based. Instead we use a non-Porous acrylic surface compound that is very flexible and that is Where you achieve the longevity that you’re looking for.  One Day Baths is the leader in the tub & tile reglazing Industry with over 15 years’ experience. Using our time-tested Method you can expect to have a luxurious bathroom in just a Matter of a few hours. We exceed all industry standards of the restoration process. In Fact, that’s what makes us the industry leader. Our products are Extremely durable and will not fade, peel or craze. 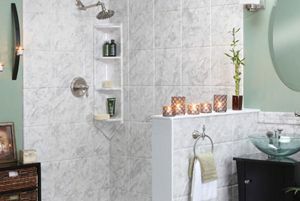 Imagine never having to re-grout your tiles again. Imagine never using harsh chemicals to clean your grout lines Again. Imagine never having to look at your 1970 pink and black or baby blue bath again. Well stop imagining and call us today 866-927-8247. Very professional and quick. We certainly appreciate the quality of service they've provided for us. We will continue to use them in years to come. Once again, thank you so much for doing a job well done. Wanted to let you know that everything worked out fabulously. Rick was as you said, the nicest gentleman and great professional, and the work is just beautiful. We couldn’t be happier with how the job went or how it came out. (As it’s still curing, my mom hasn’t tried it out yet, but if there’s a problem, don’t worry, you’ll be the first to know ;) ). Thank you for the good experience. I would gladly recommend you all to anybody. Thank You Thank you Thank you NO MORE HARVEST GOLD! Very courteous and did an excellent job of protecting the area and cleanup. Had our bathtub coated on Wednesday (May 16th) by Chris and it looks great. Wanted to say what a good job he did, he was very polite, neat and did a great job cleaning up when he was done. Again thank you for a very nice job. NY Everything i expect from a professional , on time, did what you said you would do. Very satisfied customer will be sure to tell others.